Alex Gidman re-launched his fledgling Worcestershire career at New Road with a battling 71 in two-and-half hours against Nottinghamshire in his first LV= County Championship innings for nearly six weeks. The former Gloucestershire captain was top scorer after hitting 11 fours from 126 balls but could only steer his team to a total of 269. Already Nottinghamshire are building up a robust response with Brendan Taylor and Alex Hales putting on 71 without loss from 20 overs prior to a closure because of bad light. For Gidman, the day was a new chapter after a difficult debut season in which he made one championship half-century in nine games and lost his place after suffering concussion when hit by a ball from Ben Hilfenhaus in a defeat by Nottinghamshire at Trent Bridge in June. Earlier this week he was reflecting on scores of four and one in a Second XI Championship match against Lancashire at Southport, but things changed for him with an injury to Daryl Mitchell in a Royal London Cup defeat by Surrey. Having ended a run of 68 consecutive championship appearances, Mitchell is battling to get over a hamstring problem in time to play in the NatWest T20 Blast quarter-final against Hampshire next Friday. Director of cricket Steve Rhodes is hopeful. He said: "He has significantly improved since The Oval which is a real positive sign and we are very optimistic we can get him right." The gap for this game was filled by Gidman - with the captaincy thrown in - and at a stroke his campaign took a turn for the better as he took charge of a tricky situation with four wickets gone for only 75. 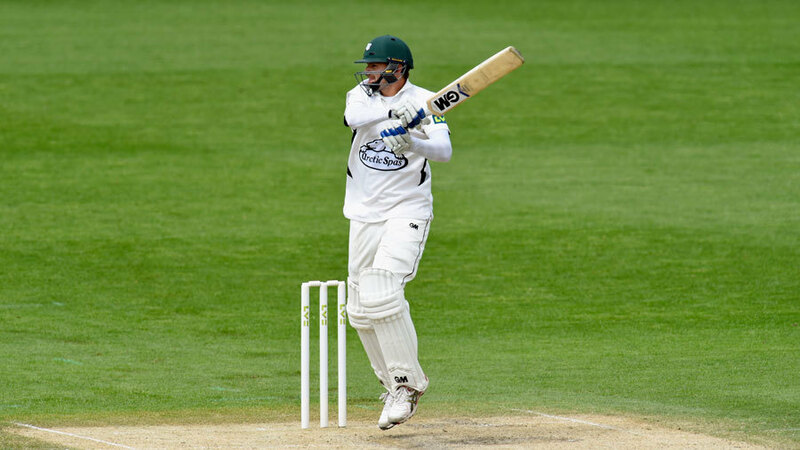 Brett Hutton, Jake Ball and Harry Gurney generally bowled good lines at a brisk pace and Worcestershire felt the absence of Mitchell with a new opening pair back in the pavilion. Richard Oliver and Brett D'Oliveira were both playing attacking shots when dismissed by Hutton and Gurney. The pattern was repeated when Tom Fell - having played well for 44 from 53 balls - was caught behind off Ball and Joe Clarke was lbw to Hutton for a duck, two days after making 131 not out on the same pitch in a 50-over game against Gloucestershire. Gidman settled things down. A little edgy at the start of his innings, he grew in authority, repairing in the initial damage in partnerships of 85 with Ross Whiteley, and 40 with Ben Cox, who again impressed with the bat in going on to 56 from 65 balls. Whiteley was undone by the bounce when caught at third slip off Ball and Nottinghamshire enjoyed more success with Imran Tahir's wrist spin. When Gidman was given out, pushing forward, it was a third catch for Chris Read behind the stumps and a first Championship wicket for Tahir with his fourth county. Cox went past 50 for the fourth time this season before falling to an athletic slip catch by Steven Mullaney as Gurney joined Hutton and Tahir in mopping up the lower order. When Nottinghamshire batted, Cox had to leave the field after 13 overs and was replaced by Clarke, who kept wicket for England Under-19s last year.